Different colours grow out of the blue and so “DEVIL MAY CARE” turns out to be a spontaneous extraordinary experience. The tremendous timing of both pianists allows them to take full risk – “devil may care” – while improvising. A lot of passages are of childishly ease. All of the songs are originals except „On Green Dolphin Street“ (arrangement Hermann Linecker) and „Over The Rainbow“ (Martin Gasselsberger solo), two delicate arranged features of standards. “Weird Blues” pays homage to the great Oscar Peterson. 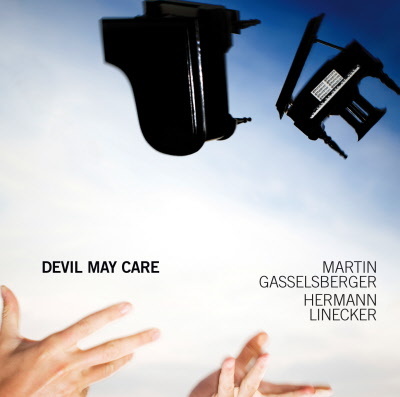 “Devil May Care” is a documentation of some kind of a “piano summit” that took place in the “Fazioli Concert Hall” in Sacile (IT), where in the first days of April 2008 a musically firework has been displayed.